Who Wore It Better? Shaheen Abbas Or Aditi Rao Hydari? It’s just me who noticed it? Well, doesn’t matter, but I am going to share this with all of you. I was going through all the pictures of Masaba Gupta’s Wedding Bash and got to know something amazing..!! 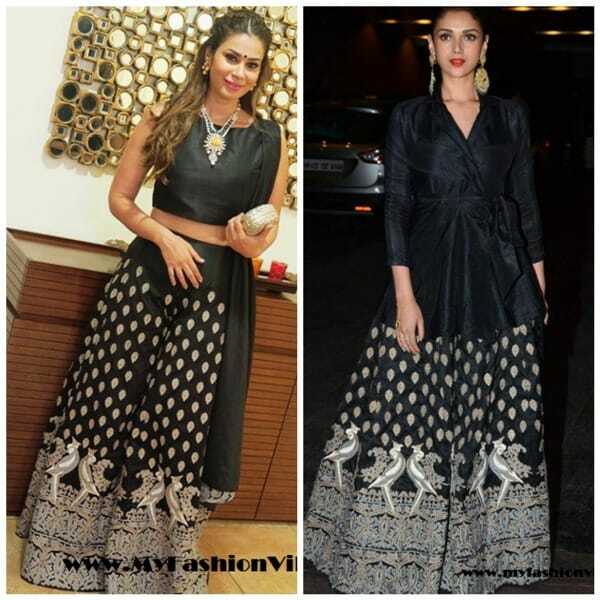 Well, Shaheen Abbas and Aditi Rao Hydari both spotted wearing the same Palazzo Pants by Yogesh Chaudhary for the same occasion; thank God the day was different. Here is the Look from Lakme Fashion Week 2015, in which Surendri (Yogesh Chaudhary) showcased this design on the ramp..!! The elegant black Mithu embroidered Palazzo Pant..!! And let me tell you, I too liked it very much, the next day I saw it. And then suddenly the same black palazzo pant I noticed worn by Shaheen Abbas at the Sangeet Ceremony of Masaba Gupta..!! Excellent..!! I have identified it. but then? Oops.. then Aditi Rao Hydari too spotted wearing the same Palazzo Pants by Yogesh Chaudhary next day on Masaba’s Wedding Reception Party 😀 Coincidence.. !! So Who Wore it Batter? Shaheen Abbas Or Aditi Rao Hydari? « Masaba Gupta’s Wedding Reception Party: Who Spotted? Wearing What?